In the recent backdrop of the electoral results, finally the hangover of 2014 elections seem diminishing if not ending. Though it would be a hasty statement to predict the national electoral outcomes based on state electoral results as these elections vary in many aspects. 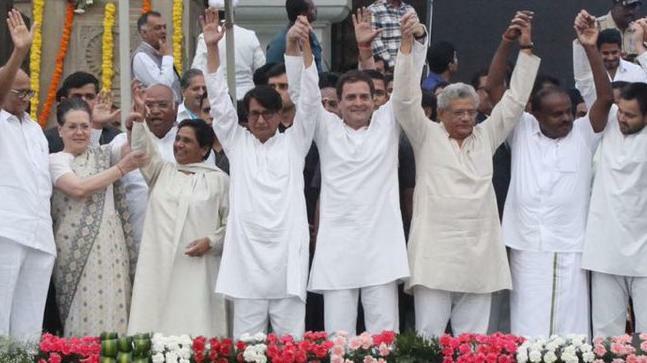 But, once again these electoral outcomes brought the importance of alliance and coalition at the forefront of political game.The 2014 Lok Sabha elections and following state elections made the ruling party feel that they can ride on the MODI wave without making any substantial compromises with their allies. The subsequent state election results gave impetus to this notion that they can set their poll narratives centred around one person the ‘Prime Minister’ and alter the ‘Parliamentary elections’ where people chose their MPs rather than choosing the ‘Prime Minister’, as a ‘Presidential style of elections’. But, the recent setbacks in Rajasthan, Madhya Pradesh and Chhattisgarh jolted the over-confidence of party whichis reflected in the party’s pre- poll strategy in Bihar where BJP headed for a compromise with JD(U), and LJP. Similarly, in Uttar Pradesh resentment in its allies can be seen. Leaders of Apna Dal and Suheldeo Bhartiya Samaj Party (SBSP) who allied with NDA in Uttar Pradesh for last Lok Sabha and state elections, advised BJP to take lessons from recent electoral results. Meanwhile, a recent ABP News-C Voter survey predicts a substantial decrease in number of seats of NDA, if the SP-BSP alliance works out. The survey foresees a loss of 43 seats, reducing it from 71 to 21 seats as compared to2014 Lok Sabha Elections.The BJP should also keep in mind that the grand alliancehas won three major by polls, in Uttar Pradesh, Chief Minister’s constituency Gorakhpur, deputy Chief Minister’s constituency Phulpur, and Kairana, where RLD was supported by the other Players.BJP won a decisive victory in 2014 general elections in which an overwhelming support from UP also played a vital rolewhere it won 71 out of the 80 Parliamentary seats. But it’s not going to be the same this time as its allies in a politically vital Uttar Pradesh are criticizing its insolence towards them. Coming to the opposition alliance and power sharing strategy, it’s also a herculean task for the Congress to forge a coalition with strong-willed and ambitious regionalleaders. Once a dominant and unhindered in national politics the Congress party has been reduced to two digits, 44 seats only. Ahead of this Lok Sabha elections Congress is looking for alliance partners as contesting alone for any National Party will not fulfil their dream of forming the national government on its own. Although, the Country has witnessed the era of ‘one party dominance’ as a Congress hegemony where party has ruled more than three decades without much hindrance. After an intervening period of a ‘Coalition era’ since 1989 to 2014 the emergence of BJP was perceived as a second ‘one party dominance’ but this argument does not hold any ground now.Ahead of this general election it seems that the way parties chose their allies will set the tone for the showdown in next general elections.Which is a good omen for this election at least. Tarannum Bano, Research Scholar, Department of Political Science, Jamia Millia Islamia, New Delhi.